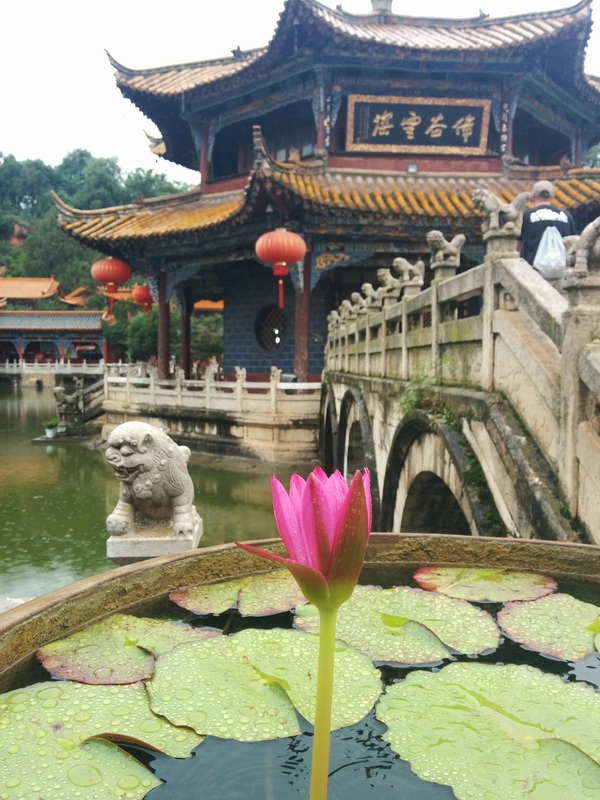 Tucked away between the famous cherry blossoms of the Kunming Zoo and the famous seagulls of Cuihu (Green Lake) lies a relatively unknown Kunming landmark: Yuantong Temple. 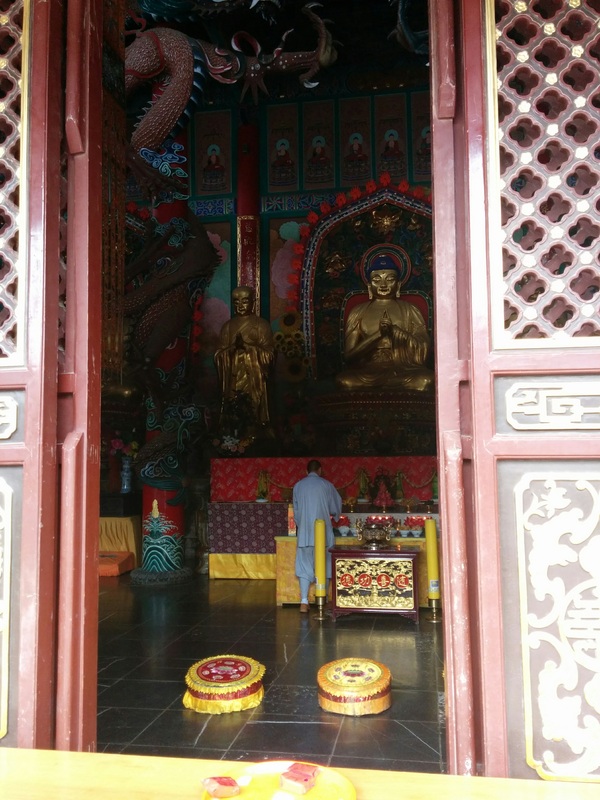 Despite its proximity to two of Kunming’s most famous sights, Yuantong Temple remains a very quiet, secluded spot along Yuantong Road. 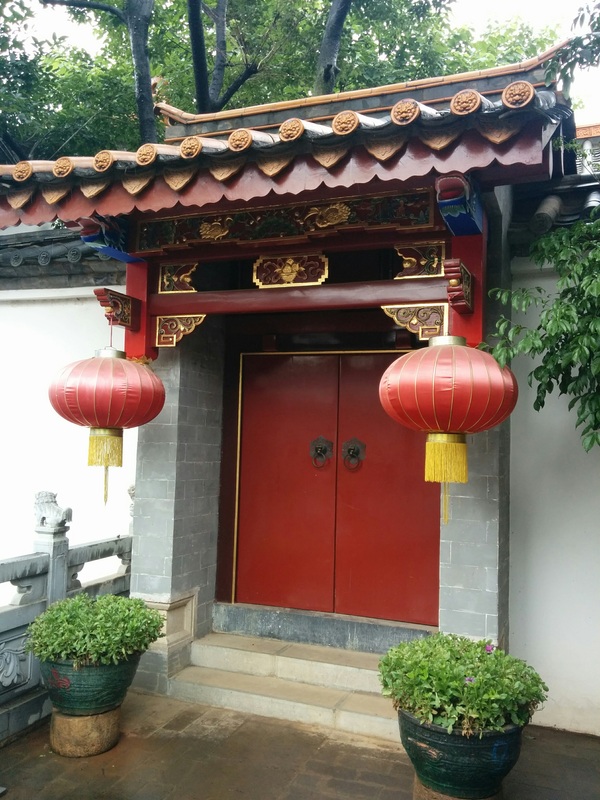 The temple was originally built over 1,200 years ago during the Tang Dynasty, though it has undergone various renovations and additions since then. 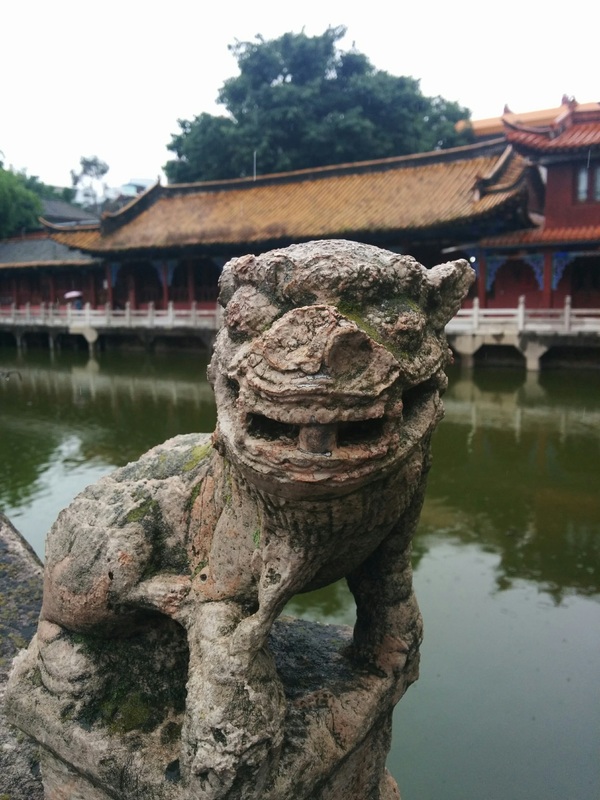 These include statues that were added during the Yuan Dynasty, dragon pillars added in the Ming Dynasty, and a copper likeness of Sakyamuni that was sent as a gift from the people of Thailand in the 80s. 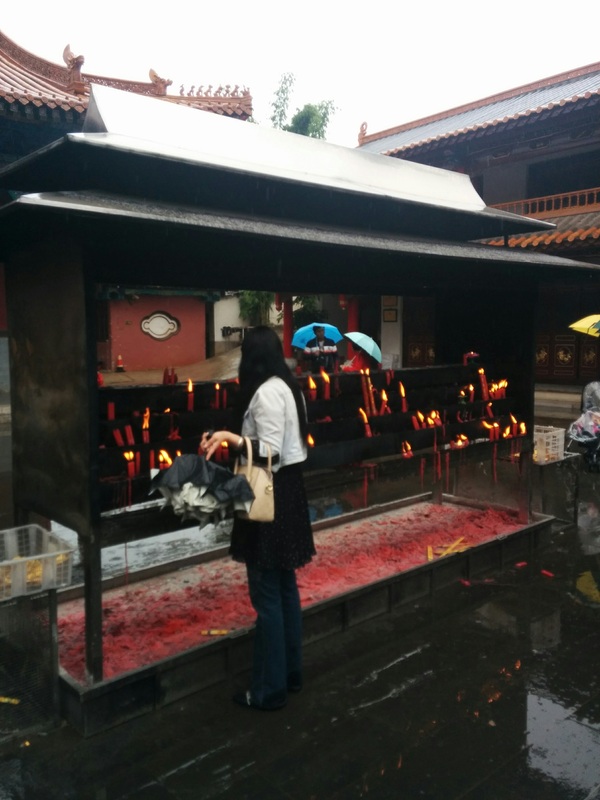 Yuantong is still an active Buddhist temple, and you will see worshippers lighting incense and monks chanting. Still, it is not a very busy place, though I’ve read it can get crowded during major holidays. 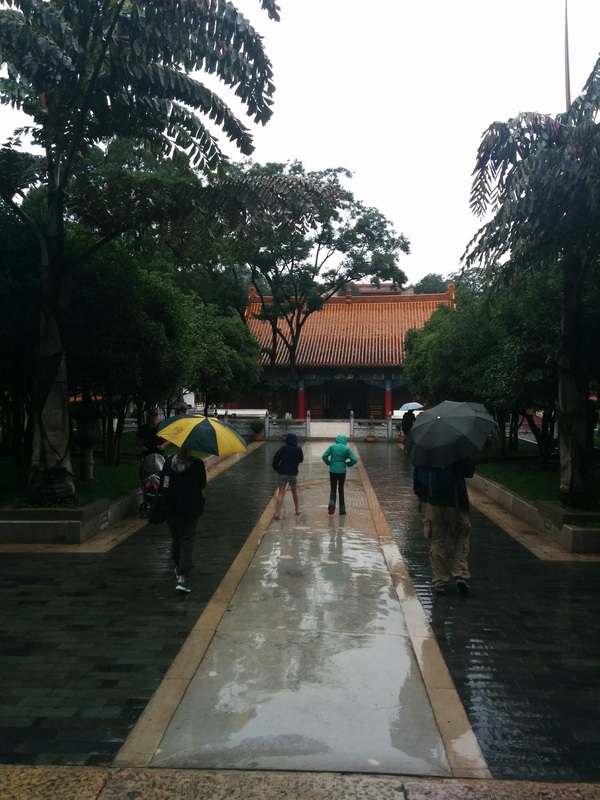 We visited Yuantong Temple with our friends on a rainy day last month. 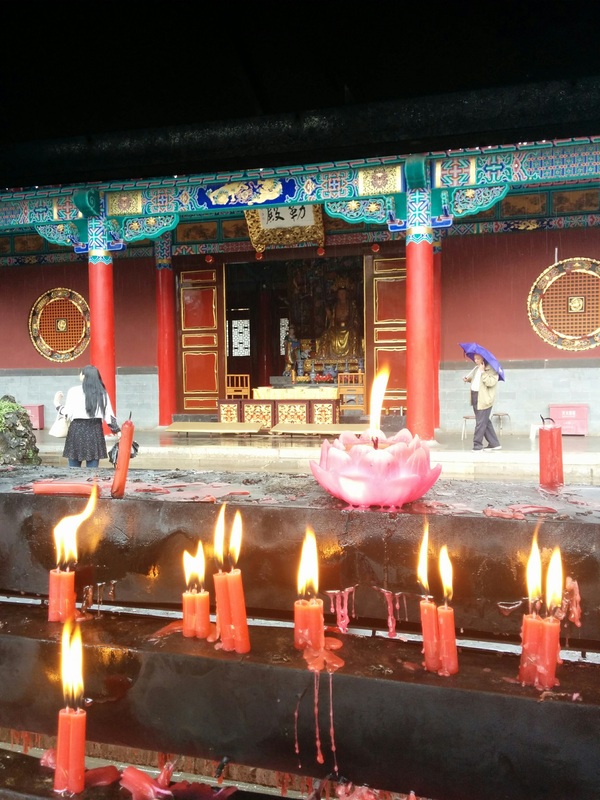 I’d been interested to see it since moving to Kunming, but most people I know (including my family) were not so keen on seeing yet another Chinese temple. 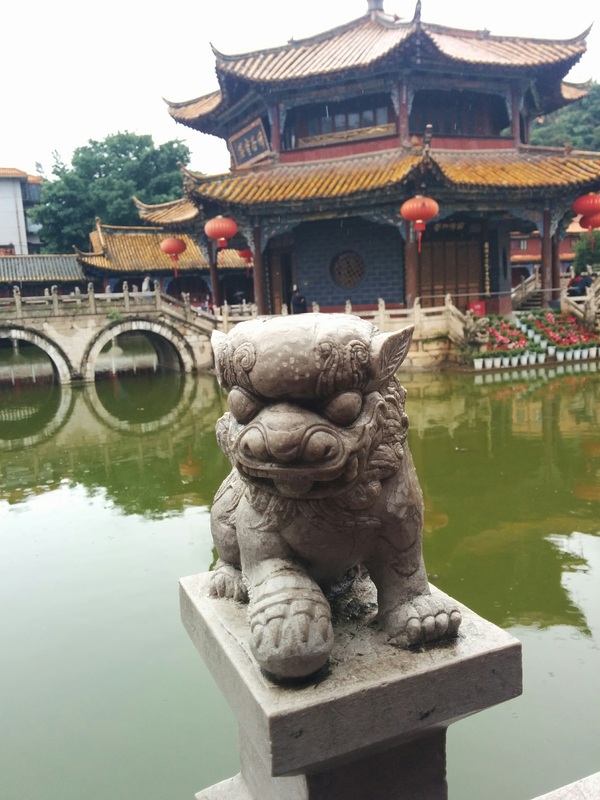 Yuantong is supposedly the only temple in China that lies inside a city. Once you are inside the temple complex, though, it’s hard to believe you are still in urban Kunming. It’s very pretty and very quiet. You can even hike a trail up the mountain at the back of the complex, making it feel even more like you are out of town. Yuantong is also one of the only Buddhist temples in the world that is built at the bottom of an incline. You must enter by walking down a slope, rather than climbing stairs upwards, as for most temples. 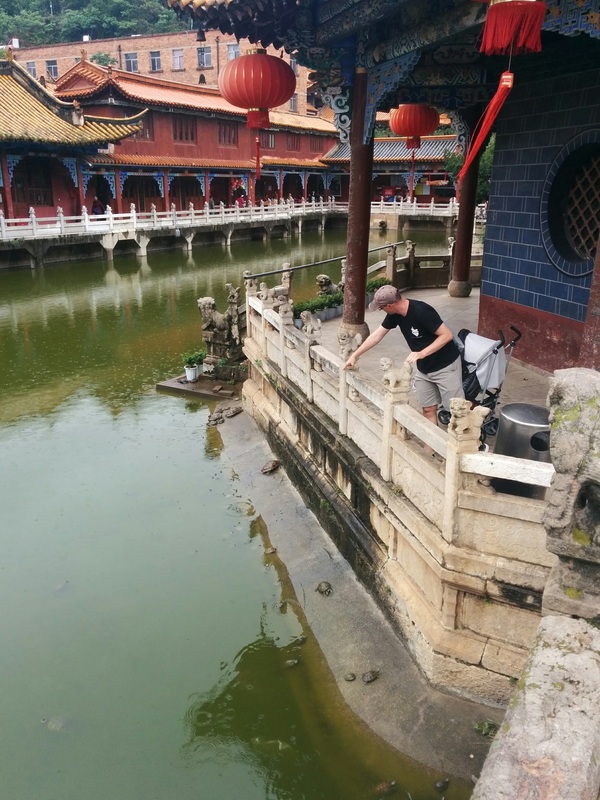 The center of the complex features a “Fish-Releasing Pond” but I think it should probably be called something more like “Oodles of Turtles Pond.” Turtles are the thing most visitors comment on when they visit Yuantong, and it’s certainly the thing our kids liked the most about this place. Holding an umbrella made it tough to get pictures, but trust me, there are a lot of these guys in the pond, along with koi and frogs. 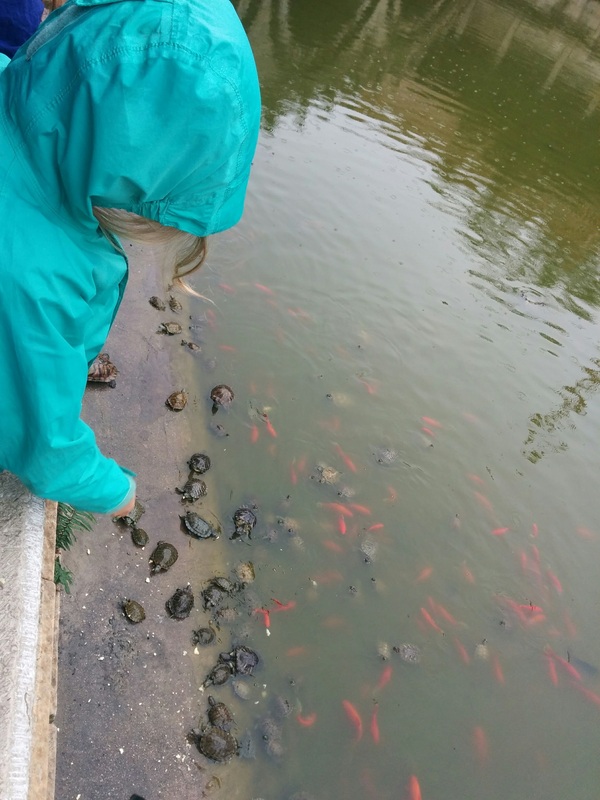 Bring along some mantou to feed them, and you will certainly attract a crowd. Admission is only 6元, and, although this is the largest temple in the Kunming area, the temple complex is small enough that you can see most of it in about 30-60 minutes. 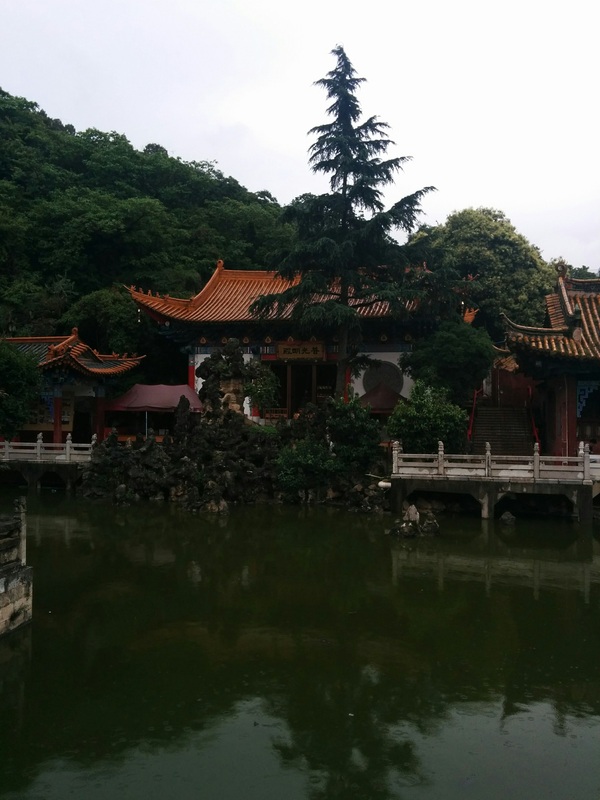 That makes it easy to add this temple to your itinerary if you are already going to nearby Cuihu (Green Lake). 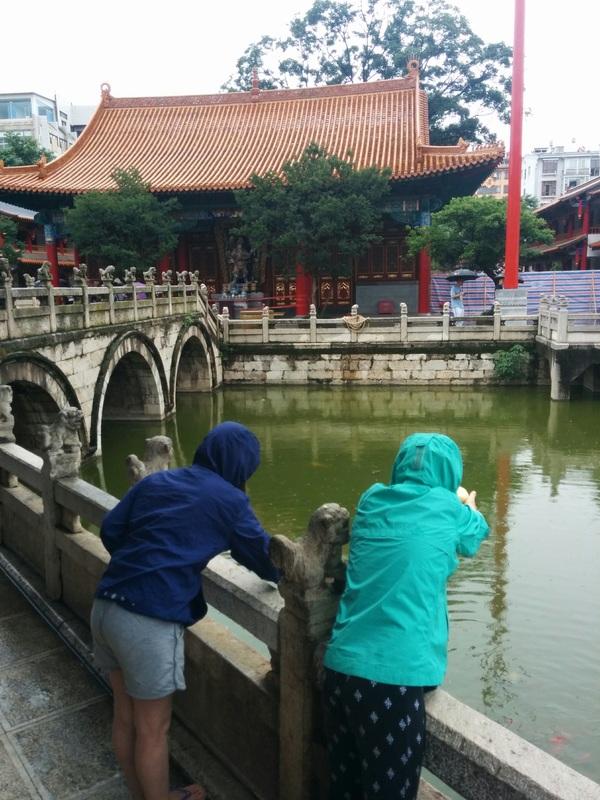 I’d recommend starting at Yuantong Temple since it is uphill from Cuihu. Hooray for quiet, and hooray for turtles! For a few more pictures and some information on the arrangement of the buildings, here’s a very short post on Yuantong’s architecture: Art and Archaeology – Yuantong Temple, Kunming For more details on Yuantong and its history, here’s the article from Travel China Guide.